Status: Fully restored. Delivered to owner. This beautiful Steinway upright came to Historic Pianos in early 2013. The owner first inquired about purchasing a Steinway Duo-Art grand, which had been a long-term goal for many years. However, he also was concerned that his living space might not accommodate a large grand as well as he would like. 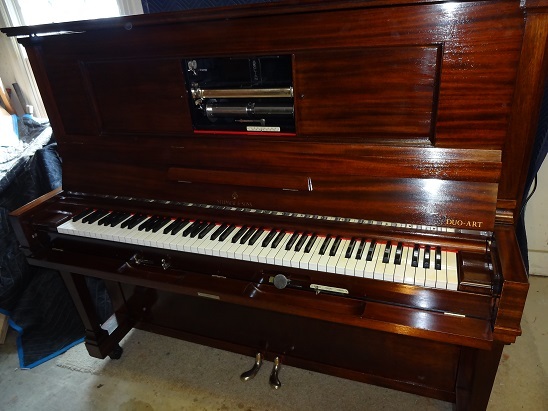 After careful measurement, he determined that an upright was his best choice, and Historic Pianos was able to help him locate and purchase an unrestored Steinway Duo-Art that was an excellent candidate for restoration. The combined cost of the unrestored instrument and the restoration at Historic Pianos was also considerably less than several other options he had considered. Steinway upright #187048 was sold new in 1917 by a San Francisco piano dealer, and it had apparently lived its 95 year life in California's dry, temperate climate, with the result that the instrument was unusually well-preserved for its age. Even though the player had never been rebuilt, the original pneumatic fabric had enough integrity for the instrument to play marginally. The original ivories were unusually pristine in color and condition. However, the case had been badly refinished in the 1970s, and was not attractive. But the integrity of the underlying wood appeared to be good. Restoration included complete disassembly, restringing with new custom bass strings and treble wire on new pins, and full restoration of the action, including new damper felt, stringing felt, and keybed punchings, but maintaining the original hammers that were still resilient and not significantly worn. The case was refinished in dark-red natural mahogany with shellac hand-rubbed French polish finish, closely matching protected interior sections that were not refinished in the 1970s. The player was fully rebuilt, including the very large, quiet and powerful "steamboat" air pump. Because the early 1917 player originally lacked an automatic reroll option, a custom new pneumatic reroll system was designed and built, triggered on the previously unused tracker bar position. The instrument plays well by hand and with the player. Several pianophiles who played it before it went back to its owner declared it to be "the best sounding upright" they had heard. The nearby video links on this page show the performance and sound of the Duo-Art reproducer.